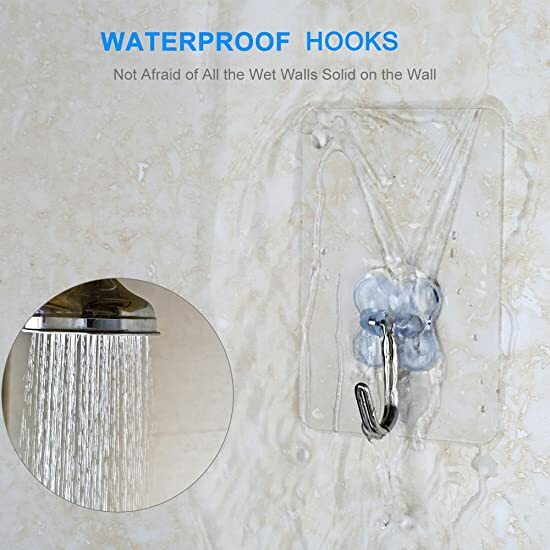 Why people like the Grawor towel wall hooks? 1.Easy to paste and won't damage your walls, no need to nail and drill. Easy to remove without surface damage. 2.Nice set of transparent bathroom/kitchen towel holder, more stylish than traditional towel hooks. The paste and the gel itself are transparent, won't undermine the overall sense of the wall. 3. Water/oil resistent, wide application for entryway, laundry room, bathroom, bedroom, cabinet, office and kitchen. 4. Temperature will not affect its adhesion. 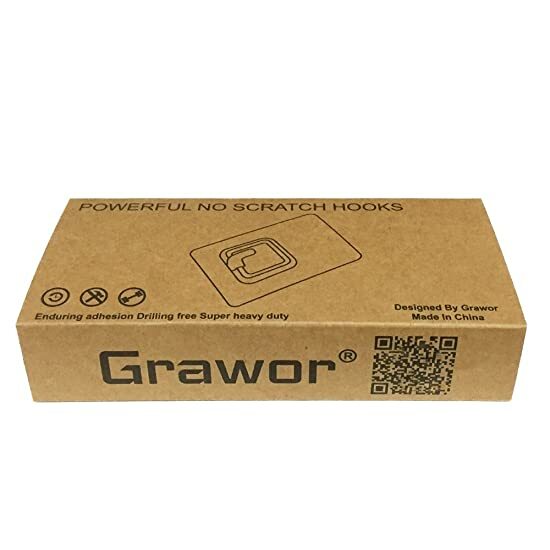 Whether several degrees below zero in winter, or high temperature 40 degrees in summer, the Grawor adhesive bathroom hooks remain firmly on the wall as well. 5.Easy to use - Just peel off the cover starting from the bulge, then put the hook on smooth and clean surface. 1. Wipe the walls or surface with a clean soft cloth, then wait until the surface is fully dry. 3. 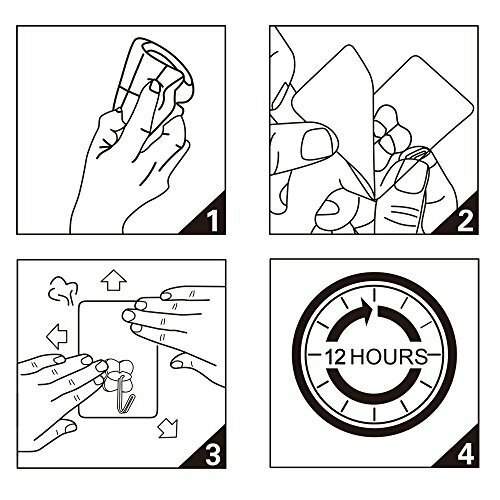 Stick the Grawor door/wall hook to the wall and press the adhesive hook vigorously, then press the whole paste area hard with your hand. 4. Try to pull the bath hook, make sure it's solid on the wall or surface. Then you can use it to hang your items. press and hold the center position of the base of the Grawor robe hook, then remove it from side SLOWLY. No residue/mark will left. To be faster, you can use a hair dryer to heat the Grawor bathroom hooks firstly, then remove it SLOWLY. ★As a owner persuing perfect, you must not wish there are holes or stains on your wall. 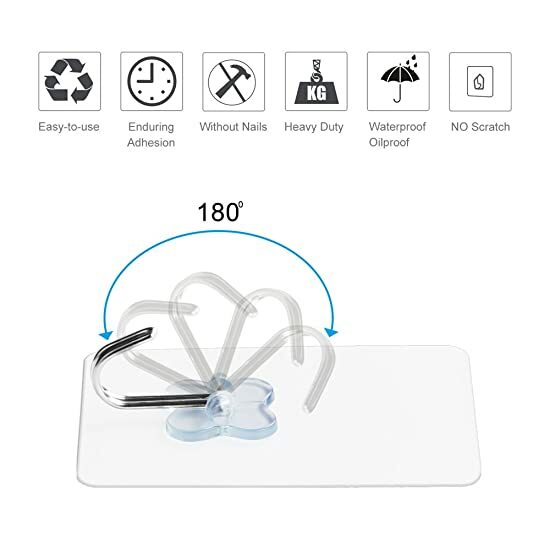 Then the transparent adhesive hooks will be your smart choice. ★You don't need to doubt its weighing capacity. 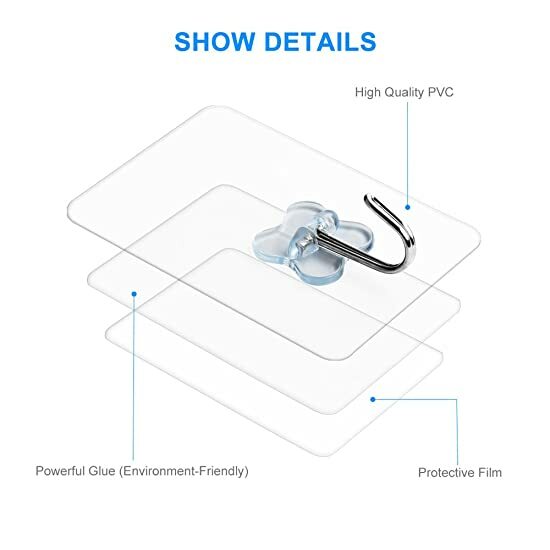 With the imported thickened strong adhesive glue and the high quality PVC backing, our hooks are super tenacious and elastic. 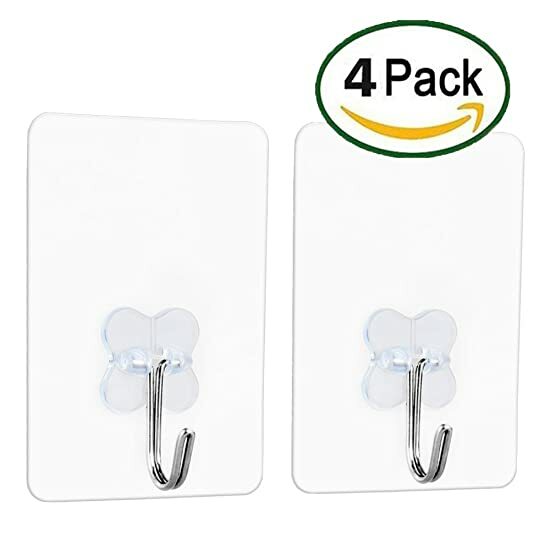 It can be easily sticked onto the slightly uneven surface, and can be firmly sticked onto the wall completely, better than the plain hooks made of hard plastic and rigid metal. 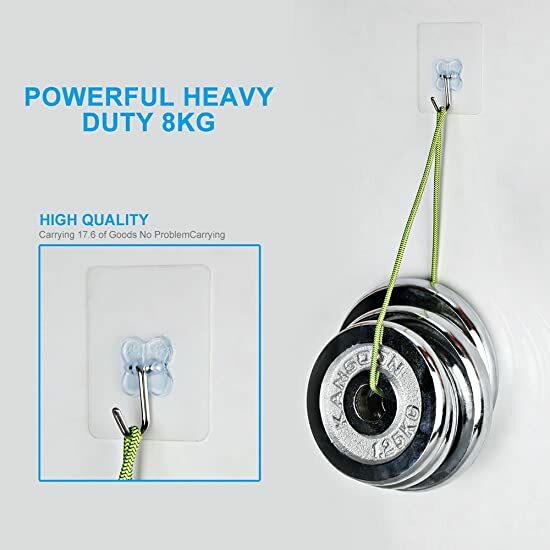 ★You can heaten it for about 3-5 seconds before using those wall hooks so that it will be more powerful.Please stick them acording to our direction. Make sure that you stick the base of the hook tightly and totally to the wall, you can use a hard plastic item to squeeze the air out. 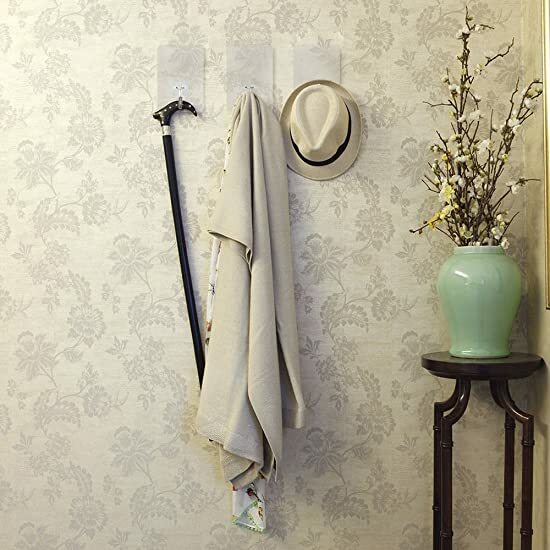 WE CAN PROMISE THAT OUR HOOKS WILL NOT FALL OFF AS LONG AS YOUR WALL REMAIN. ★Large size : 58mm(W) * 84mm(L), its adhesive backing is bigger than the counterpart wall adhesive hooks. 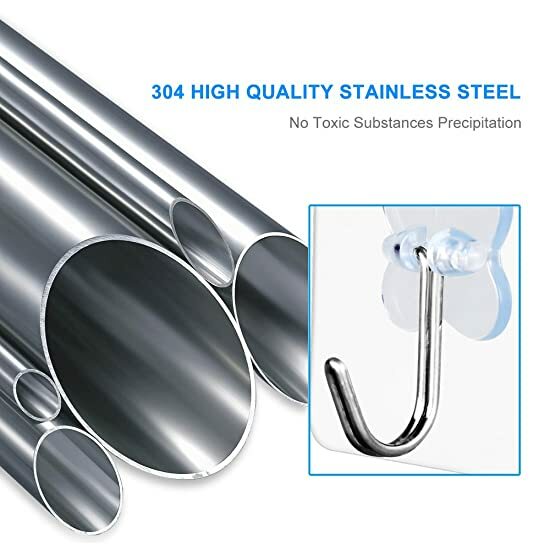 The hook is beautiful and won't get stained as it's made of 304 high quality stainless steel. Any question, please feel free to contact us. We will reply you within 24 hours. ★The wall hooks are oil resistant, high temperature resistant and waterproof, so you don't need to worry about the high temperature in the kitchen and the humidity in the bathroom.Suitable for smooth surface such as stainless steel, tile, marble, wood, glass, plastic and vinyl siding surface, can be sticked on the washing machine, refrigerator, wardrobe, shoe cabinet, door, the blackboard/whiteboard etc.. The wallpaper and besmear brushs metope are not recommended to avoid the damage of metope.